Photography with Hens - Moon Grove Farm - Farmhouse B&B, You-Pick Flower Farm. 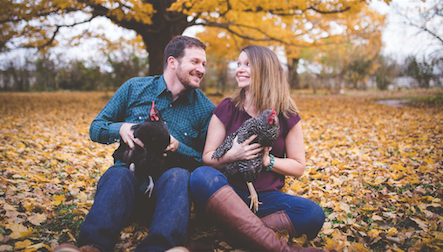 Mike and I celebrated our first year at Moon Grove Farm by doing something we rarely do, have our photos taken. We invited Kathy Stagg to meet us at the farm to snap some pics of life around the farm. All of our photos were of course very lovely, but this pic stands out for a couple of reasons. Right before the picture was taken, both Neptune and one of the crazy Barred Rocks (we call them all Elvira) went nuts, flapping their wings all over the place. It is amazing on the farm what a matter of seconds will mean as far as going from calm to chaos. Also, little did I know while this photo was being taken (but should have known better dealing with animals) that Elvira had pooped all over my jeans and it even went through my blouse. I had to run inside to do an outfit change. So much for trying to look nice for once on the farm! Either way, it was a great way to mark a major milestone - the completion of our first full season on the farm.